SAN JUAN, Puerto Rico (AP) — Researchers are warning of a new blight at sea: a swirl of confetti-like plastic debris stretching over a remote expanse of the Atlantic Ocean. 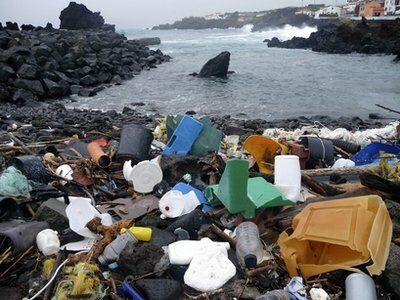 The floating garbage — hard to spot from the surface and spun together by a vortex of currents — was documented by two groups of scientists who trawled the sea between scenic Bermuda and Portugal's mid-Atlantic Azores islands. "We found the great Atlantic garbage patch," said Anna Cummins, who collected plastic samples on a sailing voyage in February. The debris is harmful for fish, sea mammals — and at the top of the food chain, potentially humans — even though much of the plastic has broken into such tiny pieces they are nearly invisible. Since there is no realistic way of cleaning the oceans, advocates say the key is to keep more plastic out by raising awareness and, wherever possible, challenging a throwaway culture that uses non-biodegradable materials for disposable products. "Our job now is to let people know that plastic ocean pollution is a global problem — it unfortunately is not confined to a single patch," Cummins said.